Born to Vincent and Adella (Mahon) Sanford, in Georgia, July 4, 1871 , Annie M. Sanford showed great musical talent from a young age. She studied music at the Southern Female College at LaGrange (also known as Cox College) , the New England Conservatory (Boston, Mass.) , and the New York College of Music  She gained a reputation as an outstanding pianist , and violinist , as well as a musical director. It was likely while she studied in New York that she met James M. Cochrane. The couple wed in Manhattan on 27 October 1891 ; Annie was 20 years old. “Cox College and Conservatory. Atlanta, Ga.”, 1900, The Digital Library of Georgia id: ful0964-85. Public Domain image. 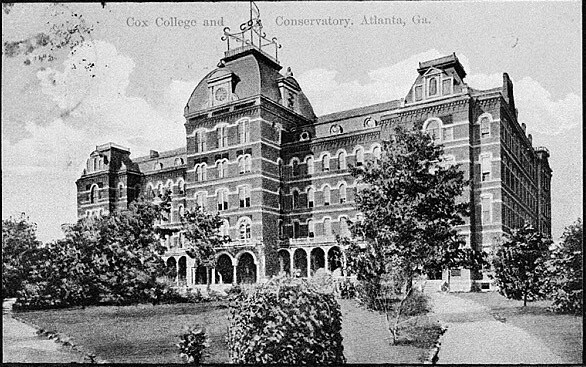 Early in 1899, the Georgia Female Seminary and Conservatory of Music formed a new department of musical pedagogics, naming Mrs. Annie Sanford Cochrane as head of the department. By just 27 years old, “…she has developed many new and original ideas as to methods in music teaching and she proposes to demonstrate these methods in her classes, which will be composed of music teachers…”  Annie was changing the face of music education in Georgia. While her professional and public life was peaking, her private life seemingly fell apart early in 1901. At the beginning of their marriage, James and Annie were mentioned together frequently in both social and musical circles in the newspapers of Georgia. [See 12] Later into their marriage, Annie is mentioned more and more frequently alone, without mention of her husband at events. Then, suddenly in mid-April 1901, her newspaper mentions change from Mrs. Annie Sanford Cochrane, back to her maiden name, Miss Annie M. Sanford. Her professional work and social circles did not change, but her husband virtually disappears from any newspaper mentions after mid-April 1901, and apparently from Annie’s life as well. 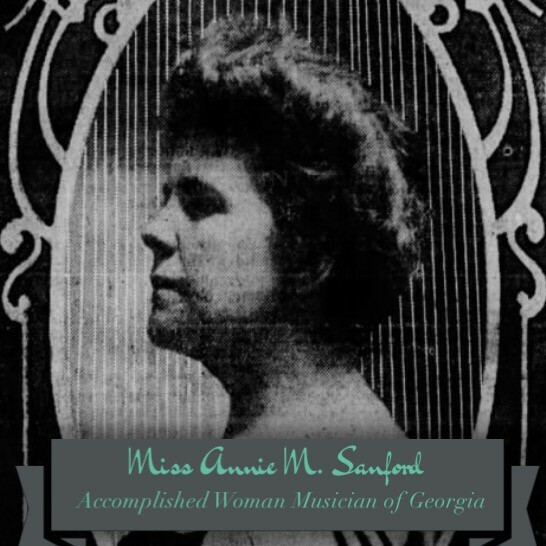 By age 33, Annie M. Sanford had made a huge impression and change in musical pedagogy throughout Georgia. She was a woman of note in music and social circles, and doing well as a single woman again. “The Gordon Institute.” The Atlanta Constitution ‎(Atlanta, Georgia)‎. 10 August 1895, Sat. Page 7. Accessed at newspapers.com on 22 March 2016. “Musical Pedagogics.” The Atlanta Constitution ‎(Atlanta, Georgia)‎. 1 January 1899, Sun. Page 10. Accessed at newspapers.com on 22 March 2016. “A Delightful Musicale.” The Atlanta Constitution ‎(Atlanta, Georgia)‎. 25 February 1892, Thu. Page 5. Accessed at newspapers.com on 22 March 2016. “Mr and Mrs J.M. Cochrane…” The Atlanta Constitution ‎(Atlanta, Georgia)‎. 18 April 1892, Mon. Page 2. Accessed at newspapers.com on 22 March 2016. “Barnesville’s Great Week.” The Atlanta Constitution ‎(Atlanta, Georgia)‎. 19 June 1895, Wed. Page 4. Accessed at newspapers.com on 22 March 2016. James Cochrane and Annie M. Sanford, 27 October 1891. Ancestry.com. New York, New York, Marriage Index 1866-1937 ‎[database on-line]‎. Provo, UT, USA: Ancestry.com Operations, Inc., 2014. New York, New York City Marriage Records, 1829-1940,” database, FamilySearch ‎(­https­://­familysearch­.­org­/­ark­:/­61903­/­1­:­1­:­24HG­-­97J­ : accessed 22 March 2016)‎, James Cochrane and Annie Sanford, 27 Oct 1891; citing Marriage, Manhattan, New York, New York, United States, New York City Municipal Archives, New York; FHL microfilm 1,452,198. “Barnesville’s Great Chautauqua.” The Atlanta Constitution ‎(Atlanta, Georgia)‎. 2 July 1898, Sat. Page 4. Accessed at newspapers.com on 22 March 2016. “Mr. And Mrs. J.M. Cochrane…” The Atlanta Constitution ‎(Atlanta, Georgia)‎. 30 April 1892, Sat. Page 8. Accessed at newspapers.com on 22 March 2016.
 : “At the recent convention…” The Atlanta Constitution ‎(Atlanta, Georgia)‎. 5 November 1899, Sun. Page 21, 22. Accessed at newspapers.com on 22 March 2016. “Influence of Music on the Diseased Mind.” The Atlanta Constitution ‎(Atlanta, Georgia)‎. 29 July 1900, Sun. Page 15. Accessed at newspapers.com on 22 March 2016. “Through the instrumentality…” The Atlanta Constitution ‎(Atlanta, Georgia)‎. 7 October 1900, Sun. Page 15. Accessed at newspapers.com on 22 March 2016. “Tuesday, July 4, governor’s day…” The Atlanta Constitution ‎(Atlanta, Georgia)‎. 30 June 1899, Fri. Page 5. Accessed at newspapers.com on 22 March 2016. “On Thursday evening…” The Atlanta Constitution ‎(Atlanta, Georgia)‎. 3 February 1900, Sat. Page 11. Accessed at newspapers.com on 22 March 2016. “Mrs. 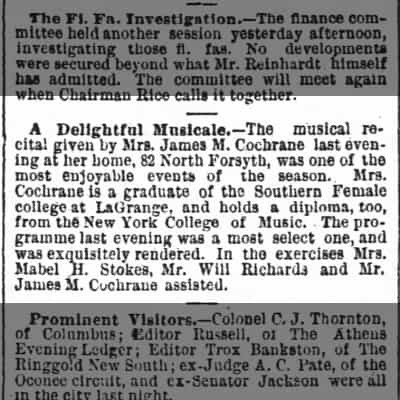 Pollard and Mrs. Printup in Musical Recital.” The Atlanta Constitution ‎(Atlanta, Georgia)‎. 14 April 1901, Sun. Page 24. Accessed at newspapers.com on 22 March 2016. “From a Noted Musician.” The Atlanta Constitution ‎(Atlanta, Georgia)‎. 10 April 1904, Sunday. Page 5. Accessed at newspapers.com on 19 March 2016. 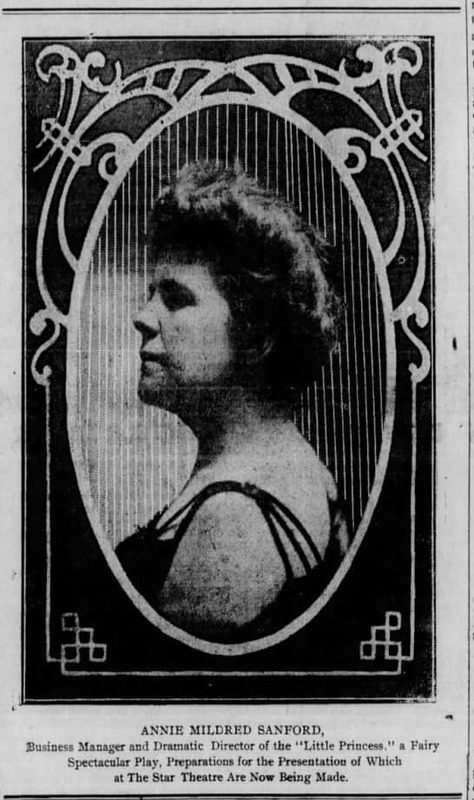 “Miss Annie M. Sanford…” The Atlanta Constitution ‎(Atlanta, Georgia)‎. 22 November 1901, Fri. Page 9. Accessed at newspapers.com on 22 March 2016. “To Miss Johnson.” The Atlanta Constitution ‎(Atlanta, Georgia)‎. 13 December 1901, Fri. Page 11. Accessed at newspapers.com on 22 March 2016. “Children’s Operetta.” The Atlanta Constitution ‎(Atlanta, Georgia)‎. 16 April 1903, Thu. Page 8. Accessed at newspapers.com on 22 March 2016. 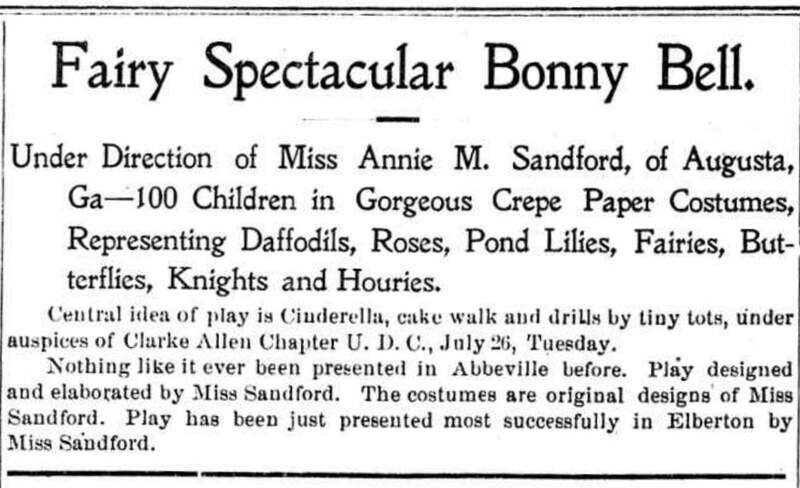 “Bonny Bell,” “Miss Annie M. Sandford.” The Abbeville Press and Banner ‎(Abbeville, South Carolina)‎. 20 July 1904, Wed. Page 4. Courtesy of University of South Carolina, Columbia,SC. Accessed at chroniclingamerica.loc.gov on 21 January 2015. “Mrs. Moorman requests…” The Gaffney Ledger ‎(Gaffney, South Carolina)‎. 9 August 1904, Tue. Page 4. Accessed at newspapers.com on 19 March 2016. “Little Princess.” The Gaffney Ledger ‎(Gaffney, South Carolina)‎. 12 August 1904, Fri. Page 8. Accessed at newspapers.com on 19 March 2016. “Miss Annie Sanford…” The Gaffney Ledger ‎(Gaffney, South Carolina)‎. 12 August 1904, Fri. Page 8. Accessed at newspapers.com on 19 March 2016. “Annie Mildred Sanford.” The Gaffney Ledger ‎(Gaffney, South Carolina)‎. 16 August 1904, Tue. Page 1. Accessed at newspapers.com on 19 March 2016. “Bonny Bell.” The Evening Index ‎(Greenwood, South Carolina)‎. 6 October 1904, Thu. Page 9. Accessed 19 March 2016. Are there any Sanford letters or diaries from her time at LaGrange up through 1903? I am researching a classmate of hers, and I have some correspondence between the two. I am interested in any material from her time at La Grange and letters/diaries particuarly for the year 1903 (with a focus on February). I did not come across any letters or diaries in my research. Most of the sources I used to compile a life sketch for Annie M. Sanford were newspaper articles. Sorry I cannot be of more help. Your research sounds interesting; best wishes for your success! I’d love to see your finished project, if you’d like to share.